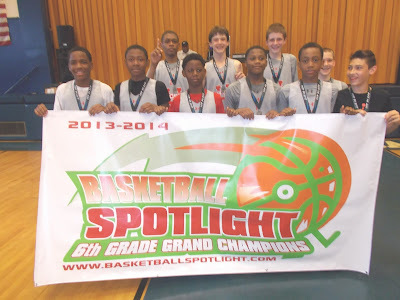 BASKETBALL SPOTLIGHT NEWS: Basketball Spotlight Grand Finale 6th Grade Championship Recap: Team IZOD Conquers Grand Finale! Basketball Spotlight Grand Finale 6th Grade Championship Recap: Team IZOD Conquers Grand Finale! Team IZOD Takes The Banner! Team IZOD turned up the defense in the second half as they defeated Team Nation 50-31 to win the Basketball Spotlight 6th Grade Grand Championship. Basketball Spotlight would like to congratulate both teams for their great seasons and wish them luck at the AAU Nationals. Stay tuned as we bring you the top performers and much more from the 6th Grade division of the Grand Finale.